St. Sixtus Abbey, Belgium, 1981. A significant aspect of Roseman's oeuvre on the monastic life is the passage of time expressed in returning to a place and the artist's paintings or drawings of an individual over the years, as with the drawings of Brother Jan Bosco with whom the artist shared a close friendship. On Roseman and Davis' first sojourn at St. Sixtus in October 1978, Abbot Remi thoughtfully introduced his two guests to Brother Jan Bosco, an amiable, white-bearded monk in his early sixties and who became a memorable subject for the artist's drawings. Prior Brother Bertrand, corresponding in English on behalf of Abbot Remi, addressed his letter to Davis, who had written to introduce his colleague's work on the monastic life and to request a sojourn at St. Sixtus. Brother Bertrand writes: "You will be very welcome here, you and Stanley. . . . It will be a pleasure for us to receive you in our monastery.'' That cordial welcome was to be repeated on their subsequent returns to St. Sixtus. Brother Jan Bosco's outgoing personality is clearly evident in this marvelous portrait in which the amiable Trappist monk looks directly out at the viewer with a friendly regard. Brother Jan Bosco, the subject of the superb portrait drawing from 1978 presented at the top of the page and below, (fig. 3), is the first monk standing in choir in the photograph shown here. "At midnight I rise to praise you, O Lord'' (Ps. 119:62) and "Seven times a day I praise you'' (Ps. 119:164) states the Prophet in the Book of Psalms. Psalmody is the foundation of the Divine Office, which is central to the monastic life. In the arresting portrait Brother Jan Bosco, Roseman has captured an immediacy of lively expression on the face of the Trappist monk. The portrait is drawn with sculptural modeling of the chalks on ochre paper, which imparts a warm tonality to the composition. The monk's ruddy complexion from years of working outside on the monastery's farm is complemented by his dark eyebrows, closely-cropped moustache, and silvery-white hair and full beard. on returns to St. Sixtus in 1994 and 1998. Roseman's drawings of Brother Jan Bosco coincide with several anniversary dates. Roseman drew Brother Jan in the summer of 1981, when the artist and Davis were invited to St. Sixtus on the festive occasion of the monastery's 150th anniversary. 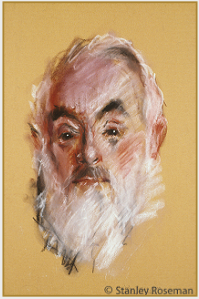 On a return to St. Sixtus in October of 1994, Roseman drew Brother Jan on his 78th birthday. Brother Jan was also the subject of Roseman's drawings when the artist and his colleague returned to St. Sixtus in 1998, the year the Cistercians and Trappists were celebrating the 900th anniversary of the founding of the Cistercian Order. 1998 commemorated the 900th anniversary of the Cistercian Order, which is dated from the founding of the Abbey of Cîteaux, in Burgundy, in 1098. Cistercian monasticism today comprises two branches: the Order of Cistercians of the Common Observance and the Order of Cistercians of the Strict Observance, also known as the Trappist Order, which developed from a seventeenth-century reform movement centered at the Abbey of La Trappe, in Normandy. In the autumn of 1978, the first year of Stanley Roseman's work on the monastic life, the artist and his colleague Ronald Davis sojourned at the Abbey of St. Sixtus, in Flanders, and the Abbey of Westmalle, in the province of Antwerp. Over the following years the two friends returned to St. Sixtus and Westmalle in the continuation of their monastic journey. Roseman created a suite of impressive drawings of Brother Jan Bosco in that ninth-centenary year, exemplified by the present work. Twenty years had passed since the artist first drew the Trappist monk who had become a dear friend. At the age of 82, the monk had let his white beard grow longer. Brother Jan's face revealed a life of rigorous asceticism in adhering to the Trappist regime with its emphasis on manual labor, long hours of private prayer, and an abstemious diet that prohibits the consumption of meat, among other dietary restrictions. In the present work, (fig. 4), strong, fluent strokes of black chalk delineate the voluminous cowl in harmony with the detailed modeling of the monk's face seen in profile. A natural daylight illuminates the monk's cranium and the whiteness of his closely cropped hair. 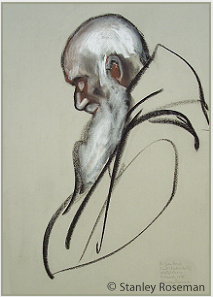 The artist's painterly use of the chalk medium combines detailed rendering with vigorous application of the chalks to define form and give a textural quality of the monk's white hair and beard. In the deeply felt drawing Brother Jan Bosco in Prayer, Roseman conveys a peaceful countenance on the face of the Trappist monk of advancing years who has devoted himself to the monastic life and a steadfast communion with God. "The Monastic Life," Page - 3 "On the Continent to Belgium, The Netherlands, and Germany. 1. The abstemious Trappist diet is explained by the Trappist monk Frère Elie, Abbey of La Trappe, in a letter to Roseman. See the website page "Correspondence from the Monasteries." St. Sixtus Abbey was where Roseman began his work on the Continent. In spring and summer of 1978 the artist and his colleague traveled to Benedictine and Trappist monasteries in England and Ireland and back to monasteries in England. At the end of September, the two friends crossed the English Channel to Calais and drove north through farmland of West Flanders to St. Sixtus Abbey, founded in 1831. The Trappist monastery, a compound of brick buildings, comprised the abbey church, the monks' living quarters, workshops, guesthouse, farm buildings, and brewery, which provided the monastery with its main source of income. In European countries where beer is the standard beverage, brewing beer is a centuries-old monastic occupation. 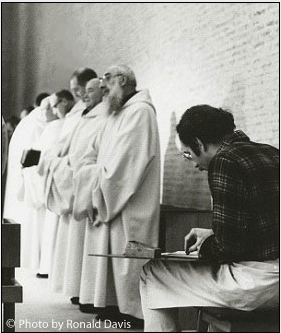 When the monastery bell tolled for the Divine Office, Roseman accompanied the community to draw at the Night Office and at the daytime offices of Lauds and Prime in the early morning, Terce at mid-morning, Sext at midday, None in the early afternoon, Vespers in the early evening, and Compline at the close of the day. Brother Jan Bosco worked in the bookbindery as well as on the farm, where he took care of the herd of beef cattle that the monastery raised as a secondary source of income. The community referred to Brother Jan as "robust" due to the demanding, physical labor that farm work requires. The monks of St. Sixtus called one another ''Bruder" (Brother), regardless whether the monk was a priest, as was John Bosco. The abbot was respectfully called ''Vader'' (Father).